Above: A publicity still of Richard Cramer from the serial The Red Rider (Universal, 1934). Although he was one of the chapterplay genre’s less prolific supporting villains, Richard Cramer was one of the most entertainingly flamboyant of them all; a shrewdly stagy actor who knew how to play ruffian roles for maximum effect, he resembled nothing so much as a live-action version of Mickey Mouse’s arch-enemy Black Pete–and, like that famous cartoon heavy, tended to dominate the screen whenever he showed up. Cramer’s considerable physical bulk and his vivid facial expressions (sometimes sneeringly gleeful, sometimes scowlingly pugnacious) were both important to his overpoweringly colorful persona, but his chief acting weapon was his highly idiosyncratic voice–a sly, precisely modulated snarl which made him sound at once harshly threatening and sardonically humorous. Richard Earl Cramer was born and raised in the Ohio town of Bryan. He acted in high school plays during his teenage years, and by the age of twenty was working in the entertainment field; the 1910 federal census lists him as living in Lucas, Ohio, and gives his occupation as that of an “inspector” (whatever that may be) in the then-embryonic “moving picture” industry. By 1915, however, he had become a traveling stage player; after touring the Midwest as a member of various stock companies, he made it to Boston and thence to Broadway in 1919. He spent the better part of the 1920s on the East Coast stage, before moving to Hollywood circa 1927; two of his earliest film roles were in the 1928 Pathé silent serials The Man Without a Face and The Tiger’s Shadow, both of which featured him as rough-hewn henchmen. 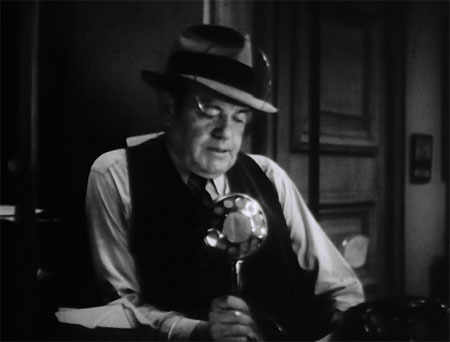 His voice allowed him to transition smoothly into the talkie era, and also set the seal on his typecasting in tough and generally antagonistic roles–gangsters, gamblers, bartenders, army sergeants, police detectives, and so forth. He was a very busy screen villain and character actor throughout the 1930s–playing large and small roles in many B-westerns and other B-films (chiefly for independent outfits like Supreme, Reliable, and Victory), taking occasional A-film bits, and doing extensive work for producers Mack Sennett and Hal Roach, who used him frequently in their comedy shorts and features (including Sennett’s The Fatal Glass of Beer, in which he served as one of W. C. Fields’ foils, and Roach’s Scram! and Pack Up Your Troubles, in which he tangled with Laurel and Hardy). Cramer also found time for periodic serial appearances during the 1930s; his first sound chapterplay was Universal’s excellent crime/science-fiction saga The Vanishing Shadow (1934), in which he played a gangster named Dorgan, the lieutenant of corrupt tycoon and political boss Wade Barnett (Walter Miller). Their joint opponent was electrical engineer and newspaper owner Stanley Stanfield (Onslow Stevens), who, aided by his own invisibility ray, the inventions of the eccentric Professor Van Dorn (James Durkin), and Barnett’s estranged daughter Gloria (Ada Ince) set out to destroy Barnett’s shady empire. Dorgan’s loyalty to Barnett became shakier as the serial proceeded, due mainly to the tycoon’s soft spot for Gloria (which often hampered Dorgan in his attempts to remove Stanfield) and to Van Dorn’s dangerous inventions (which made Dorgan increasingly resentful about having to take Barnett’s risks for him). Dorgan ultimately turned on Barnett, holding Gloria hostage in an attempt to extort some of Barnett’s ill-gotten gains; this plan backfired and brought about Dorgan’s death by police gunfire–but not before he managed to shoot down his erstwhile boss. Cramer’s confident and crafty personality made him a perfect fit for this unusually individualized action-heavy role, and he was great fun to watch in it–delivering orders to lesser henchmen with smug and sneering confidence, becoming either irritably surly or subtly sarcastic when he had to defer to the peremptory Barnett, encountering the heroes’ gadgetry with puzzled wariness, and gloating delightedly whenever he managed to seize one of their devices for his own use. 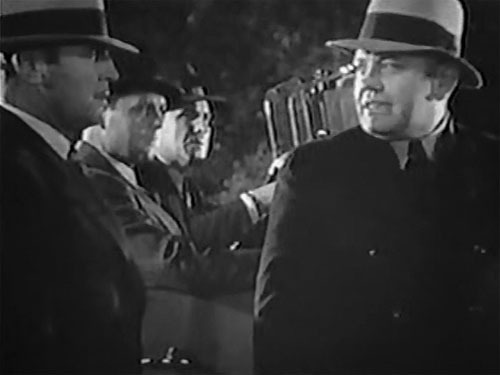 Above: Richard Cramer snarls commands to (left to right) Monte Montague, Edmund Cobb, and Al Ferguson in The Vanishing Shadow (Universal, 1934). Above: A satisfied Richard Cramer materializes to surprise the off-camera good guys in The Vanishing Shadow, after using a captured invisibility device to gain access to their newspaper office. Later in 1934, Cramer followed his Vanishing Shadow performance with an equally individualized–and even more prominent–action-heavy turn in another serial for Universal, The Red Rider. 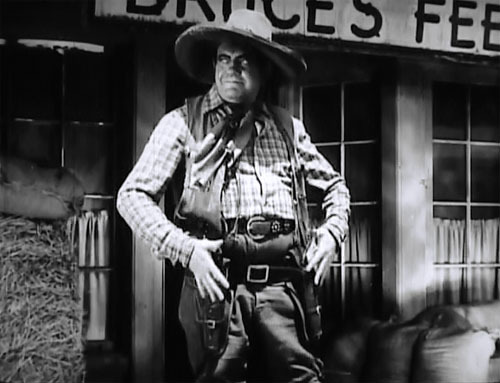 One of the studio’s best chapterplays, this unusually well-written and involving Western again put Cramer in an uneasy alliance with Walter Miller; this time, Miller played a border rancher and secret rustler/smuggler named Jim Breen–while Cramer was cast as Joe Portos, the Mexican bandit who regularly carried out Breen’s orders for him, but who wasn’t above trying to enrich himself at his boss’s expense. As in Vanishing Shadow, relations between the two villains became irremediably fractured during the later episodes; this time, however, Miller succeeded in dispatching Cramer in the final chapter, narrowly managing to turn the tables on his former henchman while the latter was preparing to extract information from him with a hot branding-iron. 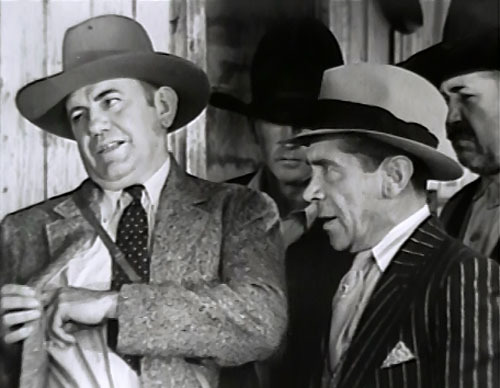 Cramer was again a scene-stealing delight in Rider, alternating between cheerful insolence and snarling rage in his interactions with Miller and with hero Buck Jones, and using a colorfully stylized Mexican accent to make his line delivery even more arresting than usual. 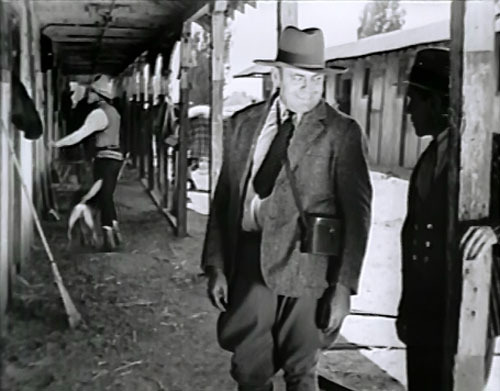 Above: Richard Cramer, flanked by Monte Montague, is about to fire point-blank at the offscreen Buck Jones–and at the camera–in The Red Rider (Universal, 1934). 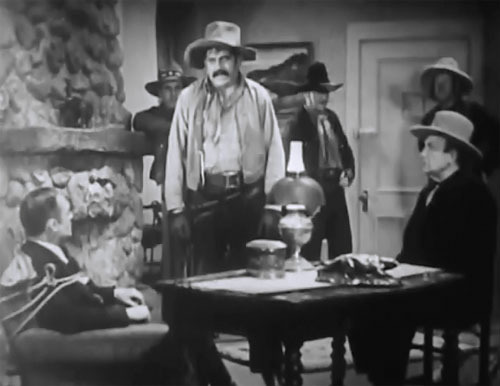 Above: Richard Cramer demands answers from prisoners Walter Miller (far left) and Charles French (seated, far right) in The Red Rider. The henchmen in the background are, left to right, Al Ferguson, Monte Montague, and Jim Thorpe. Cramer made yet another serial before 1934 was out, Mascot’s The Law of the Wild. 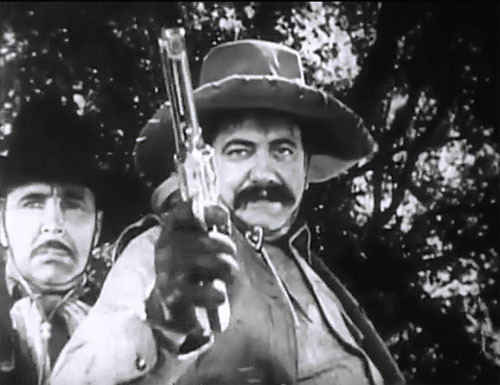 This routine but enjoyable modern-day Western centered around the struggle for control of a prize race-horse named Rex; Bob Custer played the hero, and Cramer was given his first and only serial brains-heavy role as a crooked racetrack gambler named Frank Nolan–who tried to pin a murder charge on Custer’s character in order to get his hands on Rex. Cramer’s character didn’t enter Wild till the tail end of Chapter One; he also made an unusually early departure from the serial, getting packed off to jail in Chapter Eleven and leaving his henchmen to manage the villain team in the final chapter; however, he received plenty of screen time in the many episodes between his late entrance and early exit, and made the most of it. He brushed off Custer’s accusations with glib slyness, flung back counter-accusations with overbearing smugness, pursued Rex with obsessive enthusiasm, and amusingly indulged in wry sarcasm when his henchmen failed to carry out his schemes; his character came off as unflappably cunning and self-assured, and contrasted very effectively with his chief cohorts Ernie Adams and Edmund Cobb, whose characters were (respectively) incurably jittery and straightforwardly thuggish. Above: Richard Cramer smiles at Ernie Adams as the unwitting Bob Custer (with Rin Tin Tin Jr. by his side) prepares to walk into a frame-up in The Law of the Wild (Mascot, 1934). Above: Richard Cramer prepares to prove his “ownership” of Rex with a dubious bill-of-sale in Law of the Wild; that’s Ernie Adams in the pinstripe suit and Slim Whitaker on the far right behind Adams. Cramer’s next serial, The Adventures of Frank Merriwell (Universal, 1936), gave him an actual good-guy role, albeit a short-lived one; he had one scene as an affable road-construction engineer who congratulated collegiate hero Frank Merriwell on his timely rescue of a runaway bus filled with his fellow-students, and then jovially provided him with substitute transportation–after revealing himself as a graduate of Merriwell’s school, Fardale. 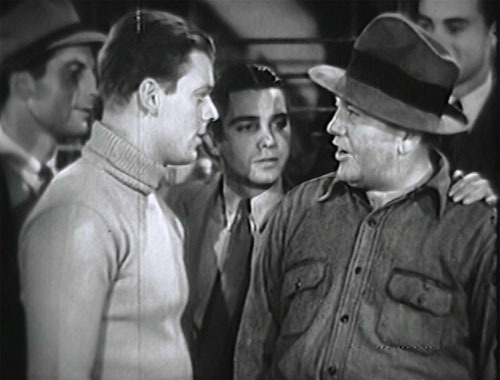 Above: Richard Cramer offers his assistance to Don Briggs (wearing sweater) in The Adventures of Frank Merriwell (Universal, 1936). 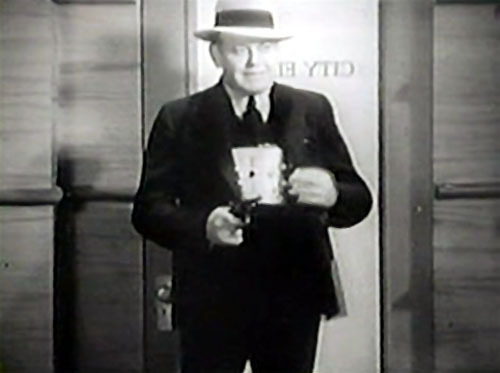 Cramer was back to villainy in The Black Coin (Stage and Screen, 1936), an action-packed but painfully low-budgeted and very poorly plotted chapterplay produced by Louis and Adrian Weiss. As a henchman named Hank, Cramer figured briefly but prominently in an early episode, impersonating a detective in order to lead the hero into a trap, and then dropping out of sight–only to resurface in the serial’s final third, in which he became a leading member of the henchman pack, and eventually betrayed his boss (Matthew Betz) by joining villainous sea-captain Shark Malone (Robert Walker) in a double-cross attempt. 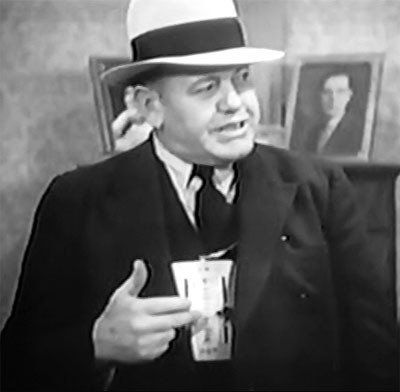 Cramer’s role in Coin wasn’t anywhere near as meaty as his three 1934 serial parts, but he still got several good opportunities to cagily spin lies and gruffly snap out threats; he also took part in a couple of fistfights with hero Dave O’Brien–and sustained serious damage to his teeth during one of these combats; he subsequently filed a workman’s-comp claim in order to make the Weisses pay his hundred-and-fifty-dollar dental bill. 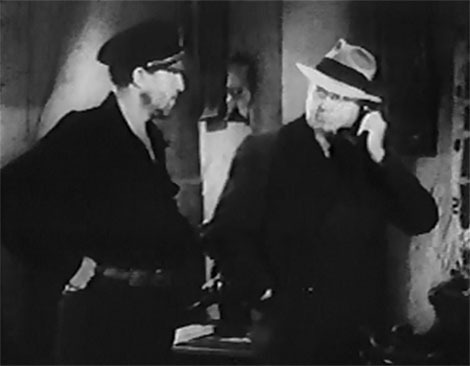 Above: Richard Cramer and Robert Walker exchange knowing glances as Cramer does some telephonic lying in The Black Coin (Stage and Screen, 1936). One wonders if the Black Coin teeth-breaking incident made Cramer somewhat wary of henchman work–since he played no more serial action-heavy roles; he would only take minor parts in his two remaining 1930s chapterplays. The first of these was Radio Patrol (Universal, 1937), in which he was briefly but frequently heard (and occasionally seen) as a police radio dispatcher; the second was The Great Adventures of Wild Bill Hickok (Columbia, 1938), in which he made a memorable guest appearance as the Apache Killer, a professional gunfighter who was hired by the villains to slay Abilene marshal Hickok (Bill Elliott) halfway through Chapter Six. 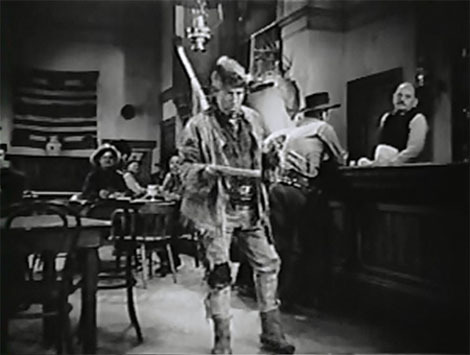 That episode concluded with Cramer confronting Elliott inside the saloon, then hurrying out of the building after shots were fired within. However, the resolution to this cliffhanger in the following episode revealed that it was the Killer, not Hickok, who’d taken a fatal bullet off-camera; the gunman collapsed on the street outside the saloon. Cramer brought larger-than-life bravado to this short-lived but juicy part–coolly boasting of his gunfighting prowess to his employers, stalking menacingly around Abilene as the narrative built up to his confrontation with Hickok, and grinningly murderously when he finally met the hero face to face; his strong personality made it easy to believe in the Apache Killer’s fearsome reputation and lent suitably dramatic punch to the unusual Chapter Six cliffhanger. Above: Richard Cramer at the police mike in Radio Patrol (Universal, 1937). Above: Richard Cramer prepares for his showdown with the titular hero in The Great Adventures of Wild Bill Hickok (Columbia, 1938). Cramer kept appearing regularly in films during the earlier years of the 1940s, but received far fewer major roles than he had during the previous decade. The independent producers who’d given him most of his bigger 1930s parts had largely faded from the scene by now, and he found himself working principally as an uncredited character actor and bit player in B-westerns for Monogram, PRC, and RKO, and in a few MGM A-movies; he received one of his last prominent roles–and one of his best-remembered–in Hal Roach’s final Laurel and Hardy feature, Saps at Sea (1940). He did a little more serial work during the 1940s, too–beginning with Winners of the West (Universal, 1940), in which he functioned, unseen, as the narrator in the final chapter, triumphantly describing the hero’s railroad-building work and papering over a story gap of two years. Conversely, his next chapterplay, White Eagle (Columbia, 1941), used his face, but not his voice; he was given a recurring bit as a saloon bartender, one of his feature-film specialties. Though he had no closeups or dialogue, he occasionally managed to sneak some amusing bits of pantomime into the background of a few scenes, reacting animatedly to saloon fights and other untoward happenings. Above: Richard Cramer (minus his usual hat or toupee) watches Raymond Hatton’s furtive behavior from behind the bar in White Eagle (Columbia, 1941). 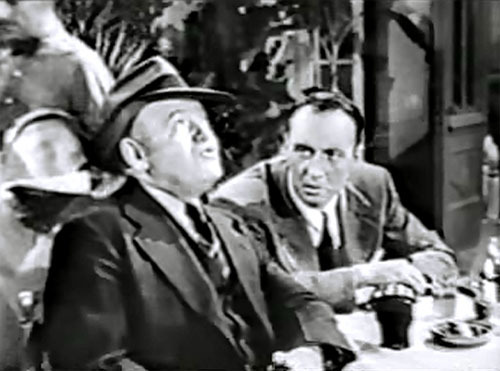 Cramer’s screen appearances slacked off precipitately after 1943; he appeared in less than a dozen films during the remaining years of the 1940s. Among these was one last serial–Who’s Guilty (Columbia, 1945), a dreary affair that was temporarily enlivened by Cramer’s presence in two of its chapters. 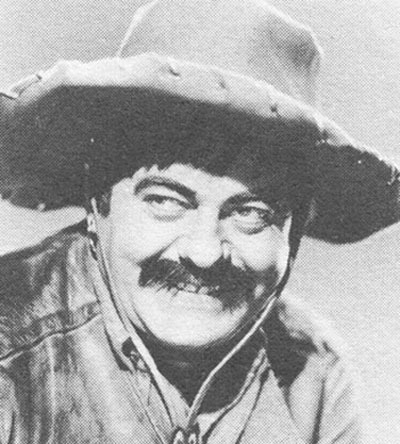 He played a shady character named Weber, a member of a gold-stealing ring who–in classic Cramer fashion–tried to make a little money on his own, after his immediate principal was captured by the Mexican police; along with a couple of accomplices, he hatched an impromptu plan to rob and murder leading lady Amelita Ward and sidekick Tim Ryan, but was thwarted and captured. Though age had made him a bit less buoyant than he was in his 1930s serials, Cramer still handled his roguery with much of his old relish in Guilty; during his time in the spotlight, he got to indulge in crafty prevarication (when telling Ward he could help her find a missing person), sinister exultation (when explaining how he planned to drown Ward and Ryan), and wry sarcasm (when his henchman Eddie Parker asked for help in fixing a tire). Above: Richard Cramer looks nonchalant while Eddie Parker frets in Who’s Guilty (Columbia, 1945). Cramer only made a few film appearances during the early years of the 1950s, and by 1953 had left the screen altogether; he continued to live in Los Angeles after his retirement, and passed away there in 1960. Classic comedy buffs still recall Richard Cramer fondly today, thanks chiefly to his several screen clashes with Mr. Laurel and Mr. Hardy; many serial fans tend to be less familiar with him, since his three most notable genre appearances were all made in earlier, harder-to-find outings. However, cliffhanger devotees who’ve been lucky enough to see his major chapterplay performances–particularly his two top-notch henchman turns at Universal–hold him in as high regard as Stan and Ollie’s devotees do; the scene-stealing brigand’s hulking swagger, inimitable voice, and subtly bombastic screen personality were unforgettable in any milieu. Above: Richard Cramer grinningly explains how he plans to pull off a double-cross in The Vanishing Shadow (Universal, 1934). Acknowledgements: The information in this article was furnished by the Old Corral’s Richard Cramer page, the federal census, volume 2 of the collected California Compensation Cases, the Internet Broadway Database, silent-serial expert Ed Hulse, and Kevin M. Maynard’s book Williams County (a history of Richard Cramer’s home county that gives a paragraph to Cramer and even features a high-school photo of him; it was printed by Arcadia Publishing in 2008).